Well I’ll be. A squirrel broke the NASDAQ stock exchange. This would have to be one of the more humorous, and easiest to repair catastrophes to strike the important stock trading exchange. So would you like to know what exactly happened that caused the NASDAQ to be totally incapacitated by a squirrel? The NASDAQ stands for National Association of Securities Dealers Automated Quotations, and is without a doubt one of the largest stock exchange in the world, being second only to the New York Stock Exchange. It was founded in 1971 and made history by becoming the first stock exchange in the world to trade electronically. It’s importance and significance only grew with time, which makes the catastrophe caused by one lone squirrel all that more fascinating. 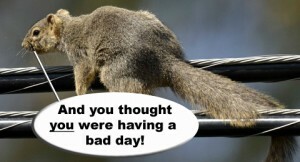 On the morning of December 9, 1987, the days trading on the NASDAQ came to an abrupt halt when a squirrel caused a major power failure in Trumbull, Connecticut. This power outage resulted an unplanned interruption to worldwide trades for 82 minutes. Yes, it was worldwide, even though the actual power interruption was only momentary. It was the NASDAQ’s mainframe computers that failed from the power outage. An impact to a stock exchange as large as the NASDAQ is clearly capable of causing a domino effect to other exchanges, and this is what happened on that fateful day in 1987. Not only was trade at the NASDAQ halted, but the Chicago Board Options Exchange, the American Stock Exchange, the Philadelphia Stock Exchange and the Pacific Stock Exchange also suffered a major trading halt. This left those who trade in over-the-counter issues with no other option but to use telephones to make the trades, which was the method used prior to the automated system being implemented that the NASDAQ used. So what was the total cost of this small financial disaster? Believe it or not, but this one small squirrel stopped about 20 million shares from being traded that day. And the squirrel. Well, it unfortunately lost its life.